Is your horse “on the bit”? There seems to be a lot of confusion in the riding world about the term “on the bit.” Lots of people tell me their horse is on the bit . . . but at least half of the time the horse is either behind the bit or over the bit. Anywhere, in fact, except on the bit. A horse is considered to be on the bit when it has engaged its back and hind quarters and reached into an accepting contact with the rider. 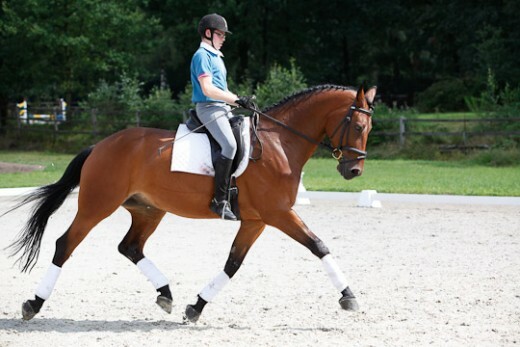 When discussed in terms of dressage, a horse that is on the bit has its head positioned on the vertical and its poll is the highest point. 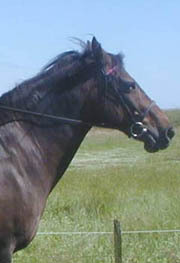 Many horses, especially in the beginning stages of establishing connection, may poke its nose out a bit or drop slightly behind the vertical. This horse is also on the bit but in the style favored in the hunter ring. He is engaged through his back, but his head isn’t vertical as it is in the example above. body and accepting an active contact, but it is more appropriate for its nose to be slightly poked forward. The horse is still engaging his back and is still balanced and light on his forehand. This should not be confused with how a horse looks when it is above the bit. When a horse is evading contact by going above the bit it raises its head high, tense its underneck neck, tightens its back, and tenses its hindquarters. When a horse is above the bit it engages the muscles on the bottom of the neck — they start to brace against the rider and in doing so, hollow their backs. With some horses, their conformation predisposes them to that way of going; other horses use it as a defense mechanism when the rider’s hands are not steady or when there isn’t enough impulsion. When a horse is consistently ridden above the bit the under side of its neck becomes muscled, rather than the top of it’s neck. The horse tends to pull itself forward on its forehand rather than pushing from its hindquarters. This horse has his neck arched but he is not taking any contact with the bit and is posing. contact. My Trakehener learned that trick from a previous owner who had ridden him incorrectly in draw reins. 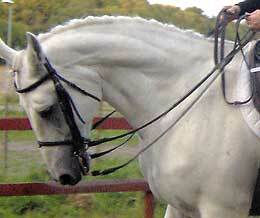 He looked pretty but his neck position didn’t move, even when the reins were looped. It’s hard to retrain a horse to accept contact when they have developed this evasion. You have to ride them very forward and use a kind bit that encourages contact. The most important part to remember about getting your horse on the bit is that it is the result of good riding (riding your horse from the hind end forward, encouraging him to lift his back and accept contact) rather than by pulling on your horse’s mouth. Sometimes a horse can be a bit above or behind the bit and still be working his whole body and sometimes your horse can pose prettily but not accept the contact at all. I agree with you! I had a very hard time getting Kroni to accept contact and not float behind the bit. He just didn’t trust it. I think that improper use of draw reins is a big cause of this trend. I’m not completely against them (draw reins can be very helpful for some horses) but most people don’t know how to use them and they crank their horse’s head in until they learn to go in that curled up position. My horse has had very harsh riders in his past, plus I think a lot of OTTBs learn to curl when being held in prior to workouts, so he has a double whammy of reasons he curls. When I got him, we were all about FORWARD all the time, and asking him to reach. It took getting him to a more above the bit position, head up and reaching out, before I could truly ask him to come on the bit. He still is a little too light in the bridle, but at least at the canter he’s starting to more and more be on the bit. Trot work, he accepts contact when we come out of the canter, but we have to transition back up frequently to get him to stay there. When he is there, things like lengthenings without a change in rhythm “magically” become easy. When he’s not, it’s a constant battle asking for forward. Fortunately, a year and almost a half later we’re getting there!